My washer at home decided to start leaking. Unfortunately I don't have enough clothes to wear until my washer gets fixed. 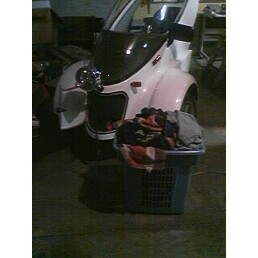 Fortunately, the BugE has ample cargo space for my laundry which can then be shuttled to the nearest laundromat. Just load up the BugE & go! Believe it or not, all my weekly laundry (minus the hamper) can fit in that cargo space. It's bigger than it looks!